No two cats are the same. Like all the cats we have ever known, each has its own personality and are all are true individuals. They vary in shape and size, small or tall, round or slender. From the short haired to the long haired and from fluffy to scruffy ! We love them all. 4D Art have brought these enchanting Cats and Kittens to life with expert sculpture, elegant lines and a loving, tactile quality. These beautiful gifts capture the personalities of cats that we all know and love so well in a stylish contemporary fashion. 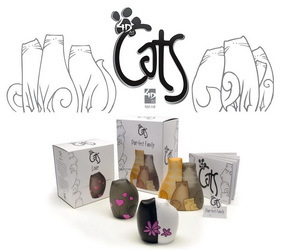 4D Cats express your feelings without having to say a word making them the perfect gift for any cat lover.